NEW YORK — I can’t even get the binoculars to work. I’m trying to look at a barred owl. These are not rare, but they are unusual to see in Central Park. A few barred owls showed up earlier this month, and at least one stayed in the park despite the New York City Marathon coming through on Sunday. There’s apparently one perched high up on a branch right across from me. And I can’t see it. I can get my left eye in focus with the binoculars, but the right lens refuses to work with my eyesight. And I’m not really even sure how to use these in the first place; I’m trying to hold them close to my face, and I end up just seeing the inside of the binoculars half the time. I try to refocus. But even when the binoculars seem to be working, at least through my left eye, I can’t spot the owl. The leaves have fallen. There is a whole crew of birders here for the owl, and everyone can see it except me. Finally, I use the viewfinder of the camera of Bruce Yolton, who blogs about hawks and other raptors in Central Park, to place where the owl is. Turns out I can even see it with my naked eyes. It’s neat! It’s pretty! I use the binoculars to get a close look at the sleeping bird for a few minutes. He doesn’t even know we’re all down here looking at him. Is it rude to look at a sleeping bird? Maybe it’s best not to think about these things. Of course the real reason I’m here in Central Park is to see the Cool Duck. That’s the male Mandarin duck, a bird native to East Asia that showed up in Central Park last month. It is brightly colored and pretty. I like ducks. I wanted to see it. The duck was first spotted by photographer Gus Keri on October 10. The news was popularized by a post on the blog Gothamist and the Twitter account Manhattan Bird Alert (@BirdCentralPark). Things reached a head when the New York Times wrote about it last week. It became the thing to do in Manhattan. I figured it was best to go see the duck with a professional, and I found one. David Barrett, who runs Manhattan Bird Alert, agreed to take me birding Wednesday morning in Central Park. The only problem was, the bird was missing. The Mandarin duck had last been spotted on Saturday. But since then, nothing. “Fowl play?” CBS New York wondered. According to Barrett, the bird is likely just somewhere else in the city—possibly the Central Park reservoir. Or maybe the Hudson River: In late October, someone spotted the duck from New Jersey. The duck, wherever it is, is not native to the area. It is not from any of the local zoos, they confirmed. It is, most likely, someone’s pet that escaped or was released. Pets that escaped from captivity now reproduce in nature in the United Kingdom, and locations in North Carolina and California now have populations. But in Central Park there’s just the one, and because Mandarin ducks have a unique chromosome count that prevents them from interbreeding with any other duck species, this is the end of the line for New York’s Mandarin duck population. Barrett is a finance guy and computer programmer—he rigged up his Twitter bird bot himself—who lives near the park on the Upper East Side. He got into birding a few years ago when looking for a way to make his walks through Central Park more interesting. It quickly became an obsession. Barrett wrote a book, A Big Manhattan Year: Tales of Competitive Birding, about his attempts to find as many bird species as possible in the borough in 2012. He is good at it, too. His website explains that “[h]is lifetime total of 267 ABA-countable bird species in Manhattan … places him second on eBird’s all-time list as of October 2018.” When I talk to him, though, I quickly learn that information is outdated: He’s up to 268 now. (The latest addition was a Harris’s sparrow, “a mega-rare western vagrant whose last record in Manhattan was over 60 years ago.”) He’s seen 222 different birds on the island this year alone. Birding—not “bird-watching,” as Barrett explains to me when I misspeak—is both a competitive and a cooperative sport. There are no real prizes for Barrett’s 268 bird finds. Bird-spotting is entirely done on the honor system, though if someone says they spotted a penguin in Central Park they’ll be sussed out. But a penguin in Central Park wouldn’t count, even if someone did spot him. The Mandarin duck doesn’t, either. Birders can only count naturally-occurring species they see. Barrett explains some birders are actually upset at all the attention the Mandarin duck has received: To a birder looking to increase his or her number of ABA-countable bird species, it’s just someone’s escaped pet. Still, Barrett says the attention has been great for him: His Twitter account doubled in followers in the last month, and he even did a phone interview for that CBS New York story while we were out birding. After seeing the owl, we hike all around the park. We check out Turtle Pond to see if the Mandarin duck is back in residence there; no luck. We hit the feeders placed by the Central Park conservancy and see quite a few birds: mourning doves, tufted titmice, hermit thrushes, black-capped chikadees, and a whole lot of sparrows. We move on, spotting blue jays and Canada geese and, obviously, lots of feral rock pigeons. Barrett has gotten good at birding: He’s identifying calls and pointing. That’s how the barred owl was first noticed: Blue jays and other birds were making noise and looking to harass it out of their territory, so birders realized some predator was there. Today, Barrett is helping me try to find a red-bellied woodpecker. Eventually, I spot one he’s pointed out flying between trees. I only see it with the naked eye, but I think that counts. We move to another body of water and Barrett gets excited. “I think I see a purple finch!” he exclaims. “That’d be huge!” But he quickly corrects himself: “I’m sorry—not huge. Huge for us today.” The purple finch is not rare, but it is uncommon in Central Park at this time of year. We spot it eating berries. It is pretty cute. Since we’re probably not going to see the Mandarin duck, I do feel like it’s huge for us today. David Barrett explains the common domestic duck at The Pond as I film it. We finally make our way down to The Pond, at the southern end of the park and the duck’s most frequent spot. It’s mostly mallards. We also spot a common domestic duck, a bird that is not native and was most likely someone’s pet who was released or escaped. It’s cute. But it can’t fly and it won’t breed with other ducks. It will just be a New York City duck until it dies. Finally, Barrett and I see something special: Three wood ducks, a native bird that is related to the Mandarin. 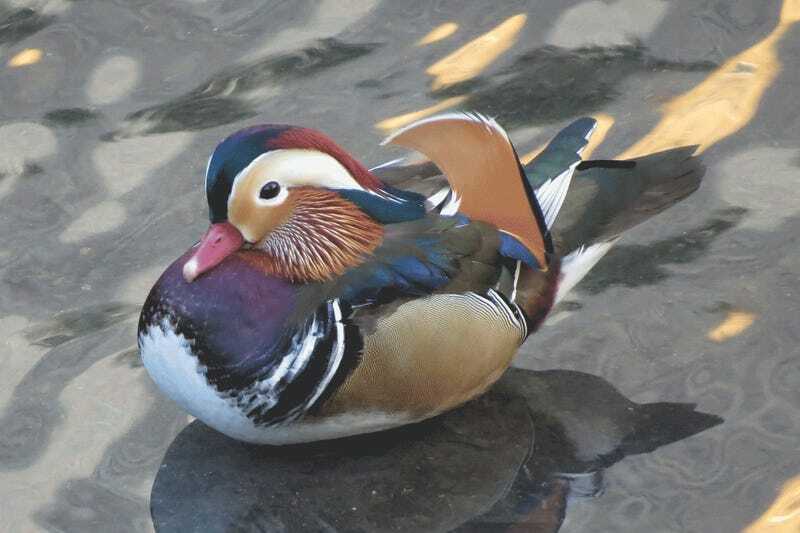 (The Mandarin and the wood duck are the only two members of the genus Aix.) Like the Mandarin, the wood duck is brightly colored. Its plumage is not quite as flamboyant, but it is cool. I zero in on it with my binoculars and take a look. Then it takes off and flies, and I keep it in my binocs. It’s headed right for me. Through the binoculars, it looks as if it’s right in front of my face though it lands 25 feet away from me. It was so pretty. And the whole thing—getting the binoculars to work, keeping the duck in it as it flew to a different location, seeing it incredibly up close—was awesome. I feel like a real birder. Later, Barrett sends me his notes for the walk: We spotted 23 different species. I’m well on my way up the eBird list. As for the Mandarin, we didn’t spot it yesterday. But the duck was not gone. It was just in hiding. This morning, one of Barrett’s Bird Alert followers got a text from her dentist. The bird is back. It’s in The Pond. I’m happy to know it’s alive and paddling. Sure, I couldn’t find it. But someone did, and that’s good enough.